Monkeys randomly pick up and drop the golf balls, meaning a player’s position may sometimes be advantaged, sometimes disadvantaged. 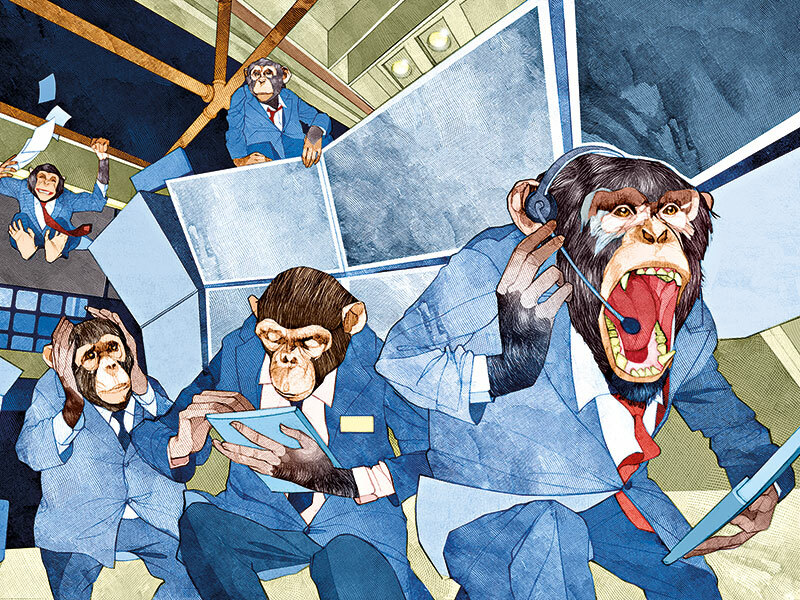 Club officials tried everything to control the monkeys, from high fences to loud noises to chemical repellents. Nothing ever worked so, in the end, the monkey rule was added. Like the exasperated golf rangers in Kolkata, regulators, venues and participants in finance have already attempted a long list of measures to counteract the effects of speed in the markets. We’ve seen rules for equal length cables in co-location facilities, Reg. 603(a) for price distribution, and everything in between. The introduction of IEX’s speed bump is the latest attempt to control the ‘speed monkey’. IEX’s recent approval has reignited the debate about speed and its role in today’s financial markets. This debate polarises people into two camps: speed is good for markets, and speed is bad for markets. The polarised nature of the debate is evidence of a fundamental misunderstanding of the nature of speed in finance and its role in market structure. Regulating speed is futile, and it is impossible to eliminate the effects of speed from the equation unless computers are banned completely. All attempts to regulate and control speed will ultimately prove ineffective, just as the fences and klaxons were useless in controlling the monkeys. The IEX speed bump may, in all likelihood, have a negative effect on markets. Blocking off a speed play at one venue typically creates multiple new speed plays across interacting venues. It is this speed asymmetry that creates the opportunity for speed arbitrage. And with a mix of fast venues and slow venues, it is harder to figure out the likely execution outcome. This results in a proliferation of new order types, rules and infrastructure enhancements to exploit or prevent the exploitation of this effect. Thus, the speed bumps can add complexity – and therefore more possible failure points – to the market. The approval of IEX shows that even the US Securities and Exchange Commission (SEC) harbours misunderstandings about speed in markets. Evidencing this is the recent declaration that one millisecond be considered de minimis for events in US equities markets. Unfortunately, the SEC declaration is off by a factor of 1,000. A decision to trade can be made in 10 microseconds or less, so it would be more accurate to name one microsecond as de minimis. If we were to attempt to handicap the markets to this scale, all participants and venues would need to be co-located on the same computer chip. Clearly this is not a practical solution, so we have to live with the realities of speed, and we have to be able to deal with the impact of co-location, speed bumps, direct data feeds, consolidated data feeds, random delay gateways, random traffic congestion and venues at distant locations. So, what is a realistic solution to speed problems in the market? The nature of speed and its impact on market price is like the weather: a complex and highly interdependent natural phenomenon that changes constantly. If we decided that it was unfair for all humans to experience different climates, the only way to standardise humanity’s weather experience would be to move all mankind to the same location, or to build some system that precisely controlled the weather everywhere. Most would recognise these ideas as ridiculous and futile. Instead, we have learned to adapt to the weather. We attempt to gain better insight into weather patterns to make better forecasts. Our ability to predict major storms and quickly take appropriate measures has arisen from the necessity of dealing with something that is effectively random and impossible to control. I propose a similar approach to markets. Understanding appropriate granularity and having visibility is key in understanding and regulating for speed. The root challenge, therefore, is not speed: it is time. The lack of precision-synchronised time is the real, urgent problem that must be solved by regulators. If we can’t see what’s going on and what order it happened in, we lack the ability to properly explain events and we will never have a market structure that everyone accepts to be transparent, fair and robust. There are signs that this understanding is happening. MiFID II in Europe mandates that all business clocks involved in high-speed trading must be synchronised to within 100 microseconds of Coordinated Universal Time with a timestamp granularity of one microsecond or better – although 100 microseconds might still not be detailed enough to reliably catch market abuses. With this granular transparency, we can reasonably judge the validity of the information and make an informed decision to trade or not trade based on our prior experiences and knowledge of the environment. This approach is agnostic of speed – in fact, a strong market structure must be able to handle diversity and unforeseen actions. Our market structure should allow for any expression of speed, or variability in speed, whether they arise naturally or are employed purposefully. We cannot try to control the weather, nor the monkeys. Instead, we have to be the best weathermen we can be, ready to play the ball where it lands. That is how we have always approached the markets: we deal with the speed environment that exists, and make informed decisions to trade that make the best of the situation. If regulators, venues and participants don’t address the fundamental need for an accurate understanding of time, we will continue to pursue ineffective agendas and ultimately fail to build trust and confidence in the operation of our electronic financial markets.